The proposals include a re-shaping of the extended library that is now given a rounded eastward wall. The new three-sided entrance of drawing  is shown here though differently detailed. 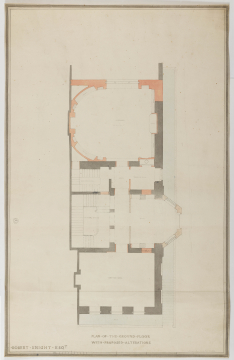 Three incisions on the right-hand side of the drawing opposite the bay suggest that an alternative design for the entrance may have been slotted in.